The Dallas quilt show started out Friday with a day of downpours and floods in the area. I am sure this brought back nightmares to the previous year when rain poured into the building on the last day. The vendors were knee deep in the muck and slush. This was not the case this year. The rain went away and the quilters came out in droves. I apologize for the lack of pictures but I ran into so many old friends and of course I am easily distracted. 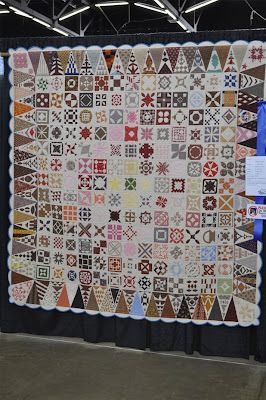 Nostalgia by Linda Wiley of Mathis, Texas was one of my favorites in the 2 person category. This wonderful Dear Jane quilt reminded me that this quilt is on my “to do in this lifetime” list. (I apologize I didn’t get the maker’s name-was distracted) I do not do the “A- word” but I always seem to take pictures of applique quilts. I guess that is Susan Stiff’s influence on me. I love using a ticking as a background. (remember this for an after market posting) This quilt is incredible. Carol Morrissey made it. She has a pattern company, O Carol Designs. I would like to think that I taught her how to quilt many years ago when I worked at the Olde Craft Store, but that is not the case. 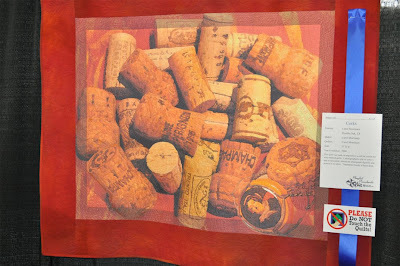 I am amazed at how people can get this kind of art out of their head and onto cloth. Another incredible artist that I am mesmerized by is Karen K. Stone. Her use of color is incredible. I can only imagine her fabric stash. There are a couple of her patterns that are also on my “to do in this lifetime” list. One of the things that Karen does is the tiniest piping that is added along with the binding. I tried to get a close-up of the small gold piping. I admire that she takes the time to do the piping. By the time I get to the binding I am ready to be done. I believe Piece O’ Cake also does this small piping. 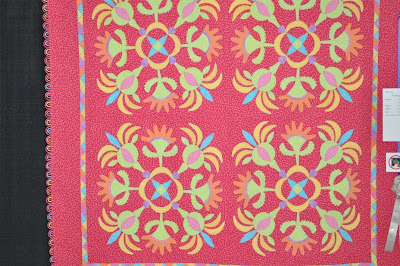 So with local teachers like Becky & Lynda from Piece O’ Cake and Karen Stone, I began to notice the small piping on several quilts. Then I came to this quilt. Yes …..applique. It was vibrant and cheery and brightened the entire area. Just the perfect quilt to brighten up the day. The most incredible part of the quilt is the binding. It is covered cording (several colors and sizes) made into little semi circles sections. WOWSER! Quilt Country had some fabric I “needed” for my I SPY baby quilt. Another old friend had a cute booth full of retro items, Ruby Jane. I guess the only bad thing is I did not win the beautiful Amish raffle quilt. 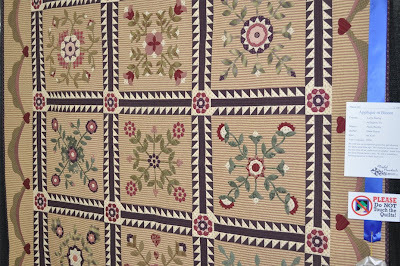 i want a dear jane quilt of my own. all those looked incredible! The quilts you shared are amazing…and I need to make a list separate from my regular “to do” list…I love the idea of a “to do in this lifetime” list! Thanks so much for the quilt show inspiration. I am a big fan of Karen Stone and Piece O’ Cake as well. The quilts you posted are absolutely gorgeous. Definitely enter your own quilts! What fun, don’t be intimidated. Enjoyed this post. The quilts are lovely! It is so wonderful to see all of the great talent that is out there! It also shows that there is a “style” of quilts for everyone! Thanks for sharing these great pics!!! I hope to get one in there someday!!! A girl has to have hope!!! Inspiring post thanks, I can’t wait until I get to my next quilt show. Great pictures, omg on the first one its AMAZING!!!! I love the one on the ticking fabric as well…. 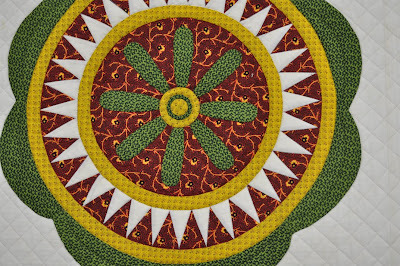 Some great quilts, especially the applique. Thanks for sharing. 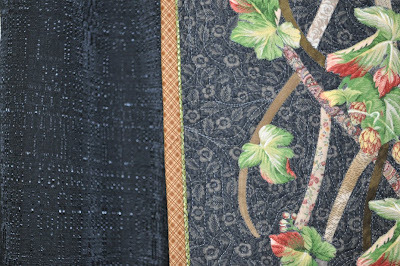 Incredible quilts. Thank you for sharing the pictures. People are so brilliant! Thank you for sharing their talents. Hooray for creative people! I think I may be sensing an applique conversion coming on! I can help you with that! When you start the Dear Jane in your lifetime you can count on me to waller through it with you! It is also on my list. But I am warning you…you might want to pick up a few applique skills first. There that word is again! I so enjoy your blog. Oh . 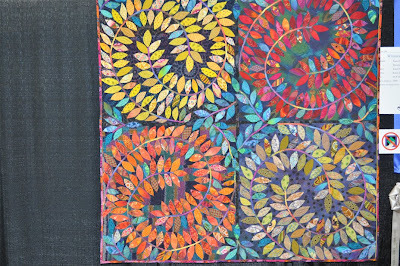 . . the quilt show looks wonderful. 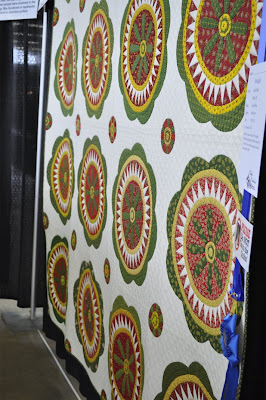 I'm looking forward to Spring Market – because this time I can actually walk around & see the quilts! I'm also smiling because we have pretty much the same things on our 'to-make' quilt wish list. I have a 'Dear Jane' started. . . (from a few ago!) 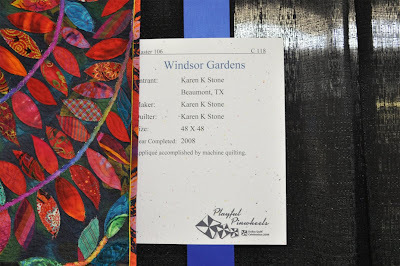 & I want to make a Karen Stone quilt sooo bad! I have, though, done the falling in love with the "A-word" thing. Just wait. . . once you are ready to start . . . you will love it!!! (& I too love a ticking stripe! I bought bolt of each of the 'Beach House' ticking colors. . . just because!!! You know that A word also stands for addicting. If you give it a try you get hooked. The quilts are gorgeous. I have a Dear Jane a little over half finished, seeing the pictures reminds me to get back to work on her. Those quilts are breathtaking! My favorite is the last one…those colors are gorgeous! And that funky binding??? WOW! Thanks for sharing!